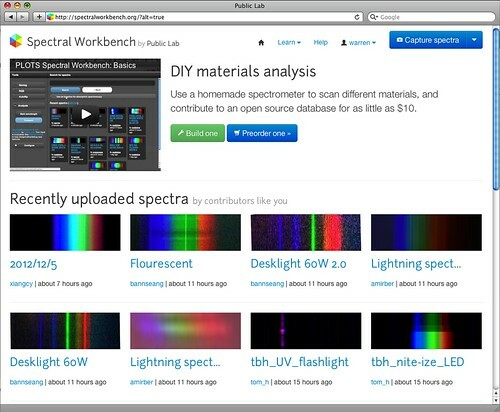 The DIY Spectrometry Kit Kickstarter video from Sept 2012, a great intro to the project. 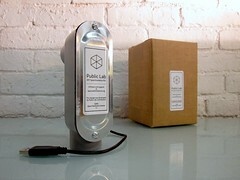 Chemists use expensive tools called spectrometers (there are several kinds) to analyze unknown solid or liquid samples. We are working on a cheap version which we hope to use to identify oil contamination in water and soil, as well as a range of other possible toxins. Spectrometers can also be used to identify species of plants or crop diseases, assess plumes from smokestacks, and have many other applications. What we perceive as a single color consists of multiple blended colors- just as green paint can be made from mixing yellow and blue paint. A spectrometer is a device that splits light into the various colors it is composed of, which we otherwise cannot distinguish with the naked eye. 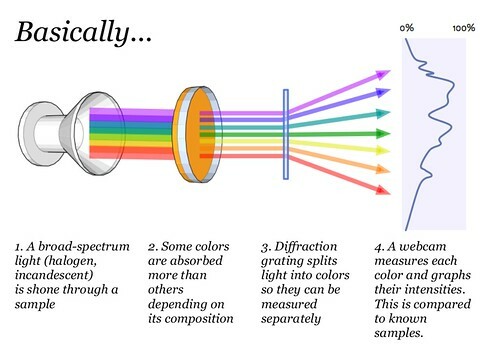 By viewing a substance through a spectrometer, one can distinguish the exact mixture of colors, which correspond to specific wavelengths of light. These can be compared to other spectra to help identify the sample. The DVD’s tightly packed grooves act as a diffraction grating — basically a prism. Though these specs look pretty good, they still need to be compared rigorously with a traditional laboratory spectrometer. Are you interested in trying it? As we ship to the different Kickstarter backers, we are posting how people have said they plan to use their spectrometers. One group of toxins common to fossil fuel contamination are PAHs, polycyclic aromatic hydrocarbons, which are generally carcinogenic. We’re trying to develop a step-by-step experimental procedure to prepare a soil or water sample, shine a full-spectrum light (like a halogen lamp) through it, and detect the missing wavelengths. 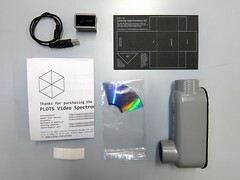 Along with the physical tool itself, the PLOTS community has also developed a software suite and online database which allows anyone to upload their data and work with others to try to interpret it. 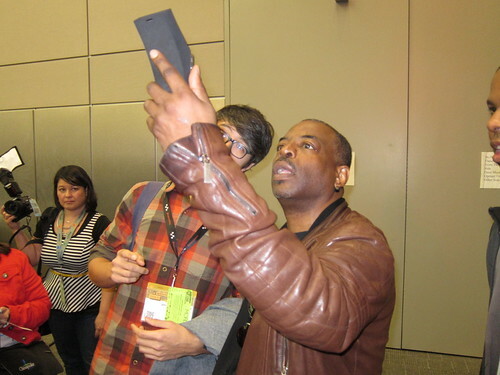 These tools are early prototypes and we’re looking for help developing them. The Homebrew Sensing Project is made possible by the generous support of the John S. and James L. Knight Foundation, Knight News Challenge: Health.